Be careful using web images and other content. Don’t let images or other online content (words, audio or video) do you in. Use royalty free images from reliable sources, such as some of our favorites: Flickr Commons, Rijks Museum, regular old Flickr, provided a relevant Creative Commons license is in play (and be extra careful here). If you purchase images, buy from a reliable source, like Getty. There are many other such sources. Don’t use images from a source at which you cannot trace image ownership. Keep a record of where you got your images. Always cite your image source. 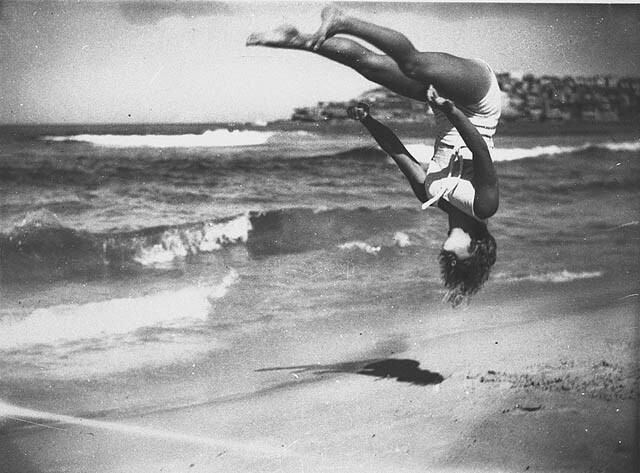 Here’s the source of the image above: Peggy Bacon in mid-air backflip, Bondi Beach, Sydney, 6/2/1937 / by Ted Hood, from State Library of New South Wales in Flickr Commons. Review today all images on your website. Have you satisfied items 1-6 above? Same goes for audio, video and words. Make sure you are using original or duly licensed content. Hope these ideas help keep your website looking great and you out of hot water. Do it right, and you too will be doing backflips! Let us know if we can help you get excellent content on your website.